This is an artist from Russia who is an art photographer. 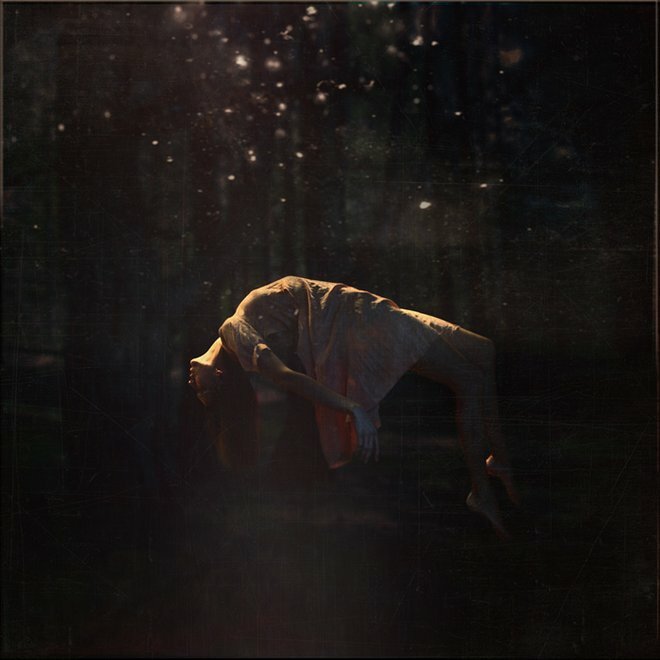 She does primarily photography by the looks of it, but she has some paintings as well. 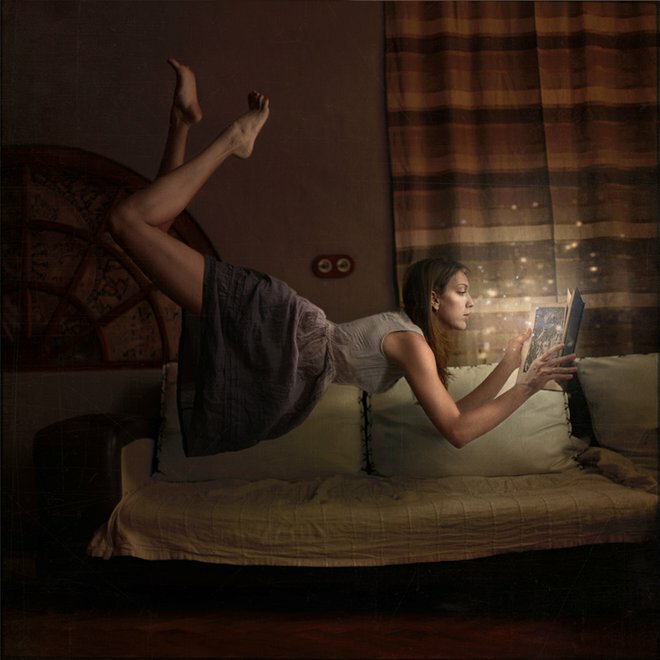 The collection concerning this blog is titled ‘distorted gravity’ and, is you could imagine, deals with the subjects floating around or struggling with gravity. 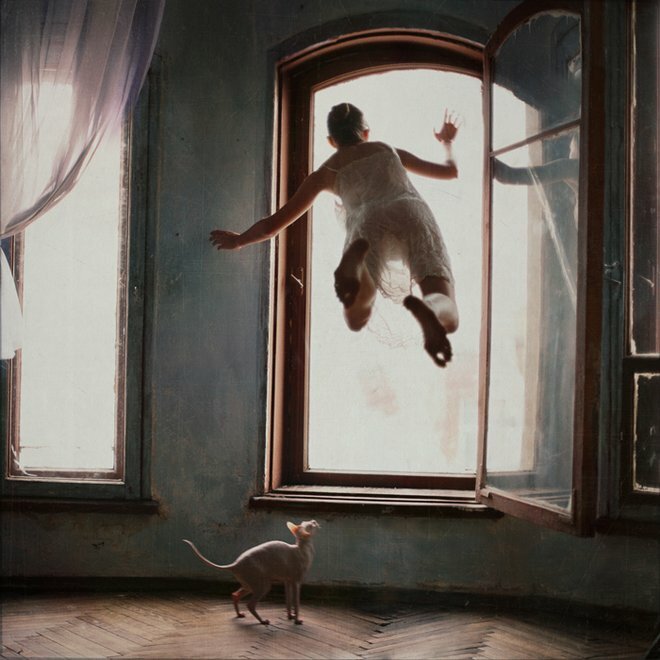 Here is her website http://anka-zhuravleva.com/distorted_gravity.html. I strongly suggest that you check out the rest of her work. I am enamoured. 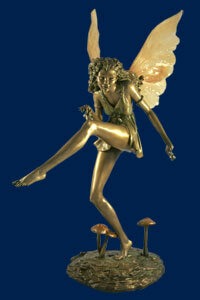 This is a really cool site selling bronze faerie figures. Some are small figurines and some are large enough to be garden fixtures. 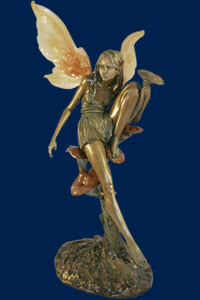 The faeries strike whimsical poses and the artistry is very fine indeed. This film is about a dark lord who wants to destroy all that is good in the world and take over it, so sends his minions to kill the only thing that could stand in his way, the personification of light and purity, which happens to be unicorns. At the same time, a princess named Lily and a feral child named Jack meet up in the forest. They’re in love and Jack decides to show Lily the unicorns as a present of sorts, and the dark lord’s minions follow them in the shadows. When they meet the unicorns the goblins shoot a dart into one of the unicorns, scaring them away, and then steals the male’s horn. The female unicorn and princess Lily are also eventually captured and taken to the dark lord’s lair, and at this point it is up to Jack and the forest faeries to save the unicorns and the princess. I only heard about this movie a couple of months ago and after I watched it, I wondered why. It’s on the same level as The Princess Bride and The Neverending Story, but I suppose it wasn’t a book first. I was kind of skeptical when I first picked it up because Tom cruise is Jack. He was never one of my favourite actors, and he I wouldn’t peg him as being able to pull off a fantasy film… but he’s actually pretty good. Also, Tim Curry is the Dark Lord. Enough said. One of the things I didn’t like so much was how the fall of the unicorn was sort of blamed on Lily. She went to go touch the unicorn despite Jack telling her not to, and when she touched it the goblin shot his dart. After that she was more or less blamed for goblins taking the horn. This doesn’t really sit well with me. I don’t know a lot of unicorn lore, but I know that girls are supposedly the only humans unicorns can really stand, so why would a girl touching a unicorn be a bad thing? It wasn’t her touch that cursed humanity, it was the goblins. Unless she was somehow meant to personify the dark lord and his evil, but that might be getting a little too biblical in its blame. 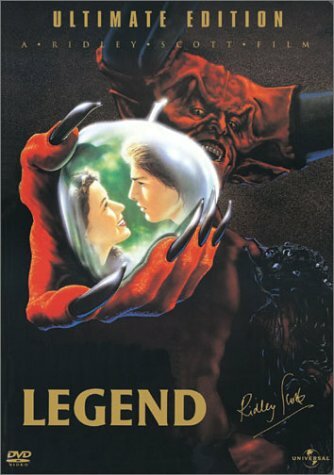 Something interesting about this movie is that, according to my Legend of Zelda friend, this film is the basis for the video game ‘The Legend of Zelda’. Wikipedia says that the inspiration for the game came from the creator’s “explorations as a young boy in the hillsides surrounding his childhood home in Sonobe, Japan where he ventured into forests with secluded lakes, caves, and rural villages.” I don’t know whether or not Wikipedia is right (you never do) but I do know for a fact that this exact explanation is how Miyamoto (the creator) came up with the idea for Super Mario Bros. … so maybe they’re just copy and pasting. Plus, Zelda was released in 1986 while Legend came out in ’85. You do the math. Knowing this you’ll be able to pick out the similarities very easily, if you know anything about Zelda that is. I was watching How I Met Your Mother the other day and the episode called ‘The Mermaid Theory’ was on. Great show by the way. Barney was in Marshal’s office and started talking about how Marshal might become attracted to his very homely secretary. Marshal laughed this off because one, he is very much in love with his wife, and two, his secretary wasn’t very attractive. Barney then goes on to explain the Mermaid Theory which goes as follows; even very unattractive women will become attractive to a man after a certain period of time. It’s called the mermaid theory because Barney made up a story about how fishermen used to be out at sea for long periods of time and they would see these manatees lying on the rocks. After a while however, with the low-level of sexual activity, the manatees started to look like hot fish women. Now this is a comedic story commentating on the horndoggery of men, but if we try hard enough, which we always are able to do, we can see how this little story is able to open up a discussion on the creation of faeries. Some people believe that 100% no word of a lie faeries exist and are active in the every day (oh Marshal). A more popular belief in most developed countries is that faeries are mythological beings that are told in fairy tales and (really stretching it here) history/ english class. This would be a theory for the latter group. 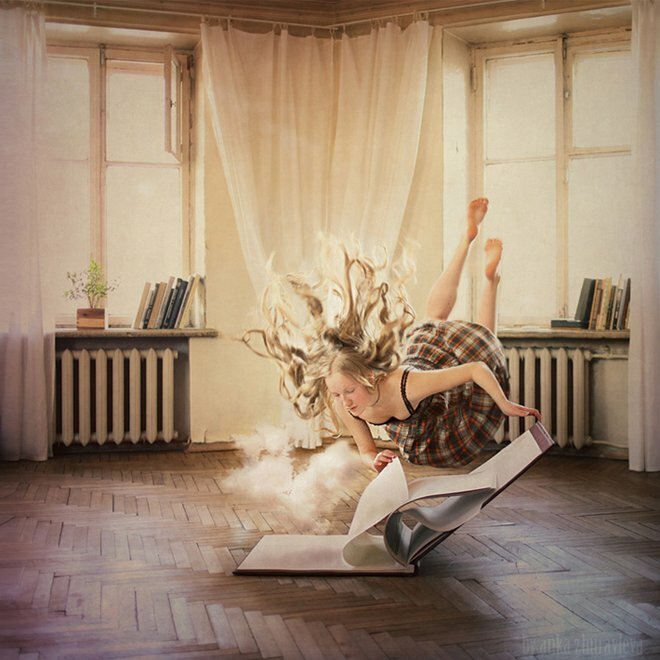 If you don’t believe in faeries, you have to wonder how the idea of them came into existence. If you look at almost every culture, at some point or another there was this belief in these supernatural beings that manifested themselves on earth through nature. 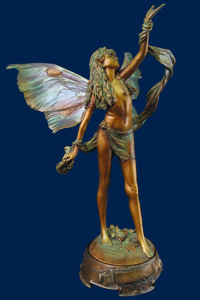 Faerie is one of the more popular words (as it is the word the English used for them and we were all conquered by the English and now speak their language), but there are many different names and different kinds of beings recognized around the world. It’s interesting to think that at some point, someone came along and thought that this idea was important. Necessary. Why would thousands upon thousands of people not only believe but live their lives according to the fact that there are magical people who live in trees? Or under mountains? Or in oceans? Maybe it was to discover some truth, understand the rhyme and reason of the universe, to just know more about the earth. Maybe it was to put fear into the people. To keep them safe and out of trouble, to take care of their surroundings. Maybe it was to just have a bond with the universe that could be understood personally, humanized if you will. There are a lot of different theories floating around and a lot of time and paper have gone into trying to understand this fascination, and the seeming necessity of supernatural belief. On a semi related but very much tangential note I read an interesting book a while ago called The Faith Instinct by Nicholas Wade. If you’re interested. 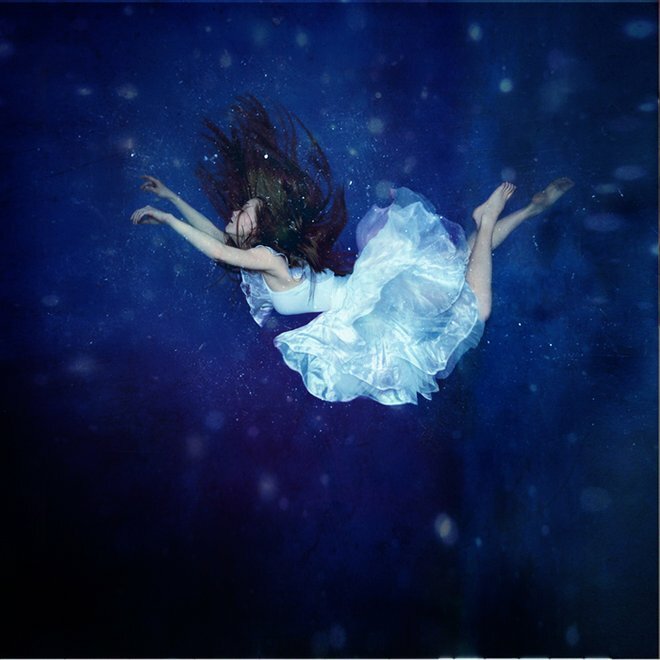 There has always been skepticism with the topic of faeries, or anything requiring faith or belief, magic or miracle, but despite that constant skepticism, that faith and belief is always there, even when you don’t see it. And when you don’t see it is when it’s the most important because it means that it’ is intrinsically a part of you and you’re too close to the situation to notice. This is kind of what I take out of the mermaid theory (in this context). 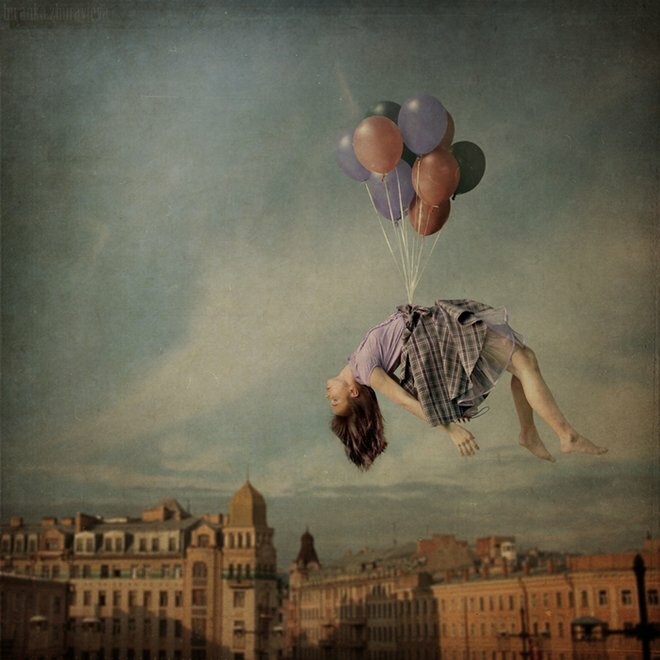 Nothing is ever just as it seems and your mind will always be messing with you, but the degree to which you begin to believe in a fantasy and the context of that fantasy dictates whether or not we think it’s acceptable. If I were to walk into work and tell people I believe in gnomes and nymphs I might be labelled as a person who’s not all there… maybe wasn’t love enough as a child. If I were to listen to someone talk about this ‘mermaid theory’ however, I would be able to relate that experience to how people interact with each other and think to myself, oh man isn’t that guy just an observant son of a gun. Both ideas are talking about the mind recognizing a truth that your eyes may not understand, but only one of the stories would be deemed credible because of the setting and the audience. Something to think about.